Have you ever held a grudge past the point where you really should have let it go? Once, during a particularly heated multiplayer game, I found myself staring daggers at my friend Jeff as he turned several dozen Elves and Saprolings sideways and aimed them in my direction. Craterhoof Behemoth had just made each of them incredibly large, and I dropped from 60-odd health down to 0 in a single, brutal attack. As the rest of the table finished the game, I shuffled my deck and nursed my wounds. I didn't know how, but I knew Jeff would pay for knocking me out so suddenly. Opportunity struck in the very next game, when Suzie's Goblin deck got off to a jackrabbit start. I developed a tentative alliance with Jeff, and together, we did what we could to fend off her onslaught. We were just about to turn the tide when I bounced two of Jeff's creatures and swung for lethal at him, instead. "What are you doing!?" he cried. "If you kill me now, Suzie's going to obliterate you!" I shrugged. "30 damage coming your way. Are you going to block?" Then, on Suzie's turn, I died, too. If you know your Dominarian history, you may recall that Varchild was one of the most important military leaders at the end of the Ice Age. At the time of Lim-Dûl's rise, the nation of Kjeldor was weak and scattered. Balduvian raiding parties were getting bolder and stronger, invading and plundering the far-flung Kjeldoran villages. Varchild, who was born in the hinterlands, lost both her brother and uncle to the Balduvians. It should come as no surprise that she devoted the rest of her life to fighting these brutal raiders with every ounce of her will. Varchild was a cunning military strategist, quickly rising through the Kjeldoran ranks. Before long, she found herself as second-in-command to the ambitious General Garrison. Garrison was on the cusp of being named the top military commander in the nation when the queen died and her son, King Darien, took over. Darien was more hesitant to promote Garrison, so the general formed the Knights of Stromgald and planned a military coup that would involve the king's untimely death. The plan required Varchild's help, though, and Varchild ultimately decided to protect Darien instead of allowing Garrison to usurp the throne. Varchild's reward was a promotion to the top military position that Garrison had wanted. Unfortunately, she was quickly faced with Kjeldor's biggest threat yet: the powerful necromancer Lim-Dûl, who had been secretly supporting Garrison and his Knights of Stromgald. To defeat Lim-Dûl, Varchild had to fight alongside the same barbarians she hated so deeply. Her makeshift alliance won, Kjeldor was saved, and the necromancer was defeated. So how did Varchild become the Betrayer of Kjeldor after establishing herself as one of the nation's greatest heroes? Well, as the Ice Age ended and the Flood Age began, King Darien wanted a diplomatic solution to the Balduvian conflict. Varchild did not subscribe to this plan. Shortly after defeating Lim-Dûl, the general resigned her position and began fighting the Balduvians on her own. Even though Varchild was driven by righteous anger and grief, she became just as brutal as those she opposed. 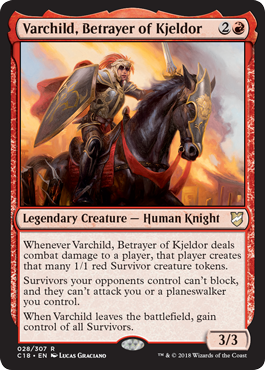 Mechanically, the first thing I noticed about Varchild, Betrayer of Kjeldor was that the card places Survivor creature tokens under your opponent's control. There's only one other card in the game that does this: Varchild's War-Riders, from way back in Alliances. Based on this awesome flavor text from Balduvian Chieftain Lovisa Coldeyes, we know that the Survivor tokens represent her people: brave Balduvians who lived through Varchild's attacks. The longer you control Varchild's War-Riders, the more pillaging they do (literally—check out the Masters 25 version of Pillage) and the more Survivors you will eventually have to deal with. Varchild, Betrayer of Kjeldor takes this relationship to the next level. She creates Survivor tokens based on the amount of combat damage she deals to a player. This makes good story sense; the more damage she deals, the more destruction she leaves in her wake. More interestingly, Varchild's Survivors are incredibly limited in what they can do as long as the vengeful Knight is still roaming the battlefield. They are too weak to block, and too afraid of retaliation to strike back at Varchild's controller. This gives the Survivor tokens a fun burst of flavor beyond the vanilla 1/1s that were established back in Alliances. Why does Varchild's controller gain control of the Survivors as soon as she leaves the battlefield? In my mind, this is the perfect representation of the alliance between King Darien and Lovisa Coldeyes that ended the fighting for good as the two warring nations merged into the prosperous kingdom of New Argive. Thus, once Varchild, Betrayer of Kjeldor leaves the battlefield, the Survivor tokens are left to join up with the rest of her former kingdom, who have now made peace with the surviving Balduvians. Neat, right? And, of course, Lucas Graciano's art is stunning as usual. His use of fiery red and regal gold does a great job of establishing Varchild's vengeance as well as her background as King Darien's top military commander. These colors also help visually tie Varchild to the burning Balduvian settlement that's visible in the background. There are a few artistic nods to Varchild's War-Riders painted into this piece, too. Not only is Varchild depicted on horseback, but her helmet has a plumage similar to that of the riders under her command. If you look closely, you can see that her "red hair" is actually part of her golden helm, painted to look like a lion's mane. The crusaders on Varchild's War-Riders have similar headwear, but theirs are far less regal. From art alone, it's clear who's in charge. There are so many flavorful ways to play with Varchild. From a collection of Ice Age theme decks designed to reenact the fight against Lim-Dûl to a tricky token-based strategy that involves trying to get as many Survivors under your control as possible, the Betrayer of Kjeldor is begging to be tinkered with. Right now, I'm most excited to brew up a deck where my main goal is to attack one of my allies with Varchild so that they can use the Survivors to help take out a common foe. It's perhaps a little ironic that Varchild, Betrayer of Kjeldor is so good at creating multiplayer alliances, but this strategy does a great job of encapsulating her unique place in Dominarian history. Varchild may have gone against her king's wishes in the end, but her actions directly lead to Lim-Dûl's defeat and thus the establishment of New Argive. Just don't tell her that the Balduvian survivors of her vengeance will go on to join the Kjeldorans in a new era of peace and prosperity!